DECATUR -- Michael Lowe, Decatur, died October 3, 2017 in hospice care after a lengthy illness. Michael was born in Decatur, November 5, 1942, the first son of Morris W. and Zelna M. (Lucas) Lowe. Michael was a lifelong Decatur resident. A graduate of MacArthur High School, Michael attended Millikin University and DeVry Technical Institute at the original Belmont Ave campus in Chicago. Michael was a lifelong member of First Presbyterian Church in Decatur. Michael is survived by two brothers, Lynn Clark Lowe, MD, (Kathleen Ziak) of Warren RI and Mark Stuart Lowe (Peter Ilasa) of San Francisco, CA. He is also survived by two nephews, Andrew and Matthew, and niece Elizabeth Bentley, all of Rhode Island. A memorial service for Michael will be held at First Presbyterian Church on Saturday, October 7, 2017 at 1 PM. In lieu of flowers, the family requests donations to First Presbyterian Church, or the Mayo Clinic: Center for Lewy Body Dementia. Cremation services provided by Moran & Goebel Funeral Home and Cremation Services, 2801 N. Monroe St., Decatur, IL 62526. Condolences and memories may be shared at www.moranandgoebel.com. I was looking forward to seeing Mike at our upcoming class 75th birthday celebration. Last reunion I had a wonderful conversation with him, which included sharing memories of our days at First Presbyterian Church and its influence on our lives. Mike was such a gentle, sensitive soul. Yes, Mike was a gentle person. 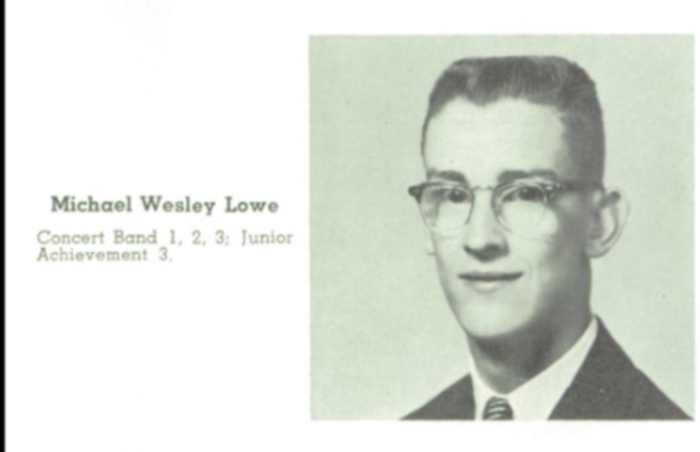 I remember him at First Presbyterian Church as well as his mom Zelna Lowe who was our church organist. She taught me piano (at Millikin) and organ (at the church). We have many happy memories of First Presbyterian.